I have to write my Library Journal review tonight so I thought I would provide something for your amusement. I have been hanging on to this photo for months waiting for a good time to post it. I don’t remember where it came from, a library newsletter I think. It cracks me up, especially given my regular garden battles with squirrels. Enjoy! There must be a story behind that sign! I can just imagine it. Thanks for the laugh, Stefanie! Joan, I know! I want the story. I want to know how many times Keith has had his lunch stolen by a squirrel. I want to know if it was really a squirrel or a coworker blaming a squirrel! whisperinggums, heh, I wonder if someone doesn’t yell whether Keith get running in to see if a squirrel is eating his lunch. Seems to me Keith should put his lunch in a drawer or the fridge unless the squirrels where he is are THAT wily! 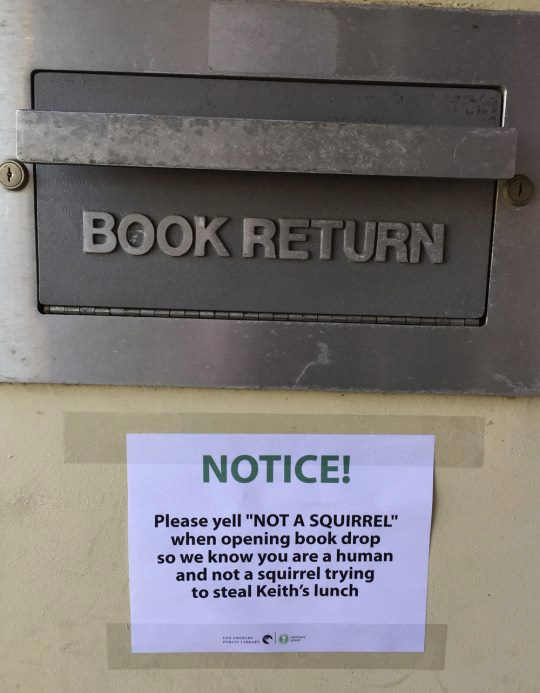 BookerTalk, I know, I want to know what Keith eats for lunch that it drives squirrels so mad they open the library book drop to get at it! Glad you enjoyed it Deepika! That’s hilarious. I wonder how many people actually yell into the book drop? Looks like you finished your review–always a nice sigh of relief. I think I have one or more squirrels nesting in my attic (again…this has been an ongoing problem). SOMEthing will have to be done about it and I have little sympathy for squirrels in my house. They are getting an eviction notice. Oh no! Not again! How do they find their way in? Hopefully when you get rid of them this time they are gone for good!